For as long as I can remember, sports and physical fitness has been and still is a constant part in my life growing up. I have always been a very competitive individual and love to prove to myself that I can do anything. My background has consisted of competitive basketball, baseball, golf, cross country, and wrestling. 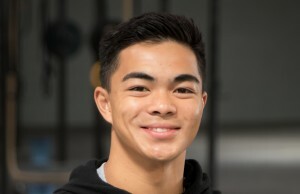 Inspired by my family, athletic background, and intrigued by the idea on how the body works; I knew coming out of San Leandro High School that I wanted to pursue a Bachelor of Science in Kinesiology at San Jose State University. Entering college I am fortunate enough to have been accepted into the Kinesiology program where later I was introduced to CrossFit by one of my friends during my Sophmore year of college in 2014. After trying CrossFit for about 3 months, I was hooked because of the idea of constantly varied functional movements performed at high intensity. This idea sparked further interest in learning about the body for me because I love physical fitness and testing my own fitness. Determined to find a CrossFit gym, I learned of CrossFit San Leandro from one of my former high school teachers. Walking into CrossFit San Leandro, I would have never thought that I would be blessed with the opportunity to Intern/work here especially in my hometown, all thanks to Coach Ruth. CrossFit San Leandro has given me the opportunity to grow as an individual, and be surrounded by a community that I can call my family. I am constantly learning and receiving knowledge from members and the other coaches, that I can apply to my future in the world of Kinesiology. I am inspired by all of you to be fitter and stronger as well as to help and be there for everyone as much as possible spreading and applying the knowledge I have learned and am still learning. I have been involved with Crossfit San Leandro for about 2 years now and it has tremendously made a positive impact in my life. I not only strive to become a better individual and coach, but also look forward to getting healthier, fitter, and stronger with the members and future members of CrossFit San Leandro.